As awarded by The Canadian Toy Soldier Miniaturists Society, in 2003, for "Consistent Quality of Workmanship"
Steve is a (very able) Disabled American Veteran (USAF Retired) who works from his home studio creating materpieces in miniature. An award-winning Toy Soldier Miniaturist, Steve is also a designer of quality Room Boxes and builder of miniature furniture. Steve has been active as "serenitychimes" on eBay since March 24, 2001. 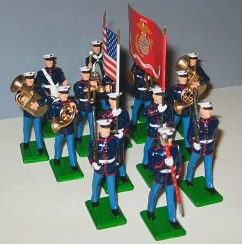 His eBay presence has centered on his line of hand painted toy soldiers and miniature bands, and he has accumulated over one thousand happy customers and a big, red star for his great customer service. So, whether it´s hand-painted toy soldiers, marching bands, or room boxes and dollhouse miniatures, you can rely on Steve, just as many happy miniatures enthusiasts have done for the last seven years.